Norfolk Southern Corporation, one of the nation’s premier transportation companies, has a historical relationship with the Roanoke Valley. Its Norfolk Southern Railway subsidiary operates approximately 21,000 route miles in 22 states and the District of Columbia, serving every major container port in the eastern United States and providing superior connections to western rail carriers. Norfolk Southern operates the most extensive intermodal network in the East and is North America’s largest rail carrier of metals and automotive products. The Heartland Corridor, a three-year railway improvement project completed in 2010, significantly increases the speed of containerized freight moving in double-stack trains between the East Coast and the Midwest. Previously, double-stack trains took longer routes by way of Harrisburg, Pa., or Knoxville, Tenn. The Heartland Corridor goes across Virginia, through southern West Virginia and north through Ohio. 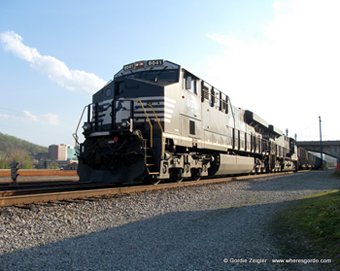 The Heartland Corridor is a five-way partnership between Norfolk Southern, the states of Ohio, Virginia and West Virginia, and the federal government. The Heartland Corridor Project 's purpose was to expand capacity, improve service consistency and reduce transit times between Norfolk ports and Columbus and Chicago. The Heartland Corridor improved the route between Norfolk, VA and the Midwest by expanding tunnel clearances to allow double-stacked Intermodal trains. A new terminal is planned for Roanoke, VA.
- Allow for the re-loading of products to comply with loading requirements, clearances, etc. - Allows companies to be closer to their final customers with a high level of responsiveness from the production site. This new center will align with the Heartland and Crescent Corridors and will serve as an added benefit to businesses locating in Roanoke, especially for non rail-served companies. This NS owned multi-commodity facility will be secured, fenced and paved, while also providing truck scales for use by transload partners for bulk transfer. The Center will accommodate up to 50 cars.